The North Sea is situated on the continental shelf of north-west Europe. It forms part of the North East Atlantic region as defined by the North East Atlantic Regional Sea Convention, OSPAR. It opens into the Atlantic Ocean to the north and, via the English Channel to the south-west, into the Baltic Sea to the east and extends to Arctic Waters in the north. The North Sea is relatively shallow, with an average depth of 90m and a maximum depth of 700m. The seabed is mainly composed of mud, sandy mud, sand and gravel with an important variety of marine landscapes, including fjords, estuaries, sandbanks, bays and intertidal mudflats. The North Sea is situated in temperate latitudes with a climate that is strongly influenced by the inflow of oceanic water from the Atlantic Ocean and by the large scale westerly air circulation which frequently contains low pressure systems. Extreme weather conditions have a direct impact on hydrography, which is characterised by water exchange with surrounding ocean areas, and strong tides. Biological systems in the North Sea are rich and complex with significant areas of importance for birds, fish and marine mammals. Approximately 230 species of fish are known to inhabit the area, with important spawning grounds for a number of commercial species and prey for birds and marine mammals. Some 10 million seabirds are present at most times of the year with extensive migration of protected species across the region. Marine mammals occur regularly over large parts of the North Sea including long-finned pilot whale, harbour porpoise, common dolphin, white-sided dolphin, Risso's dolphin, killer whale, grey seal, harbour seal, hooded seal (OSPAR, 2015). 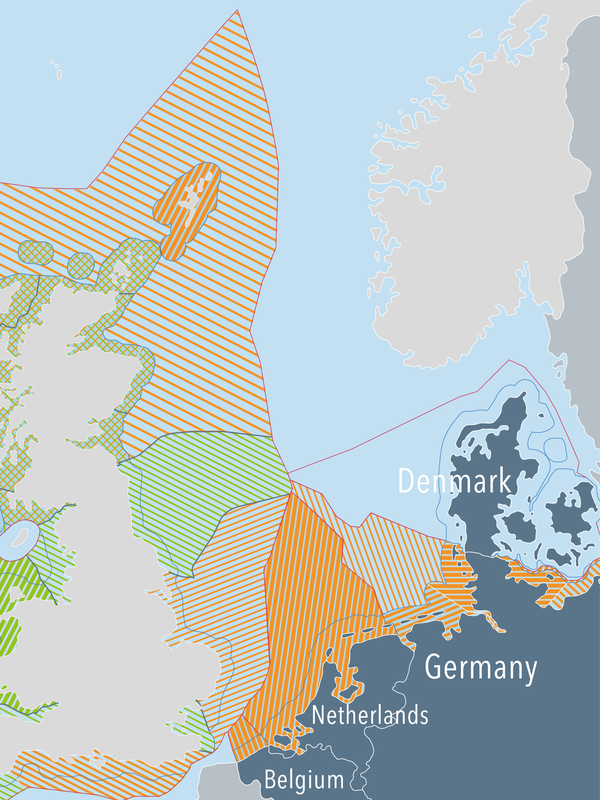 A number of areas are highly important for nature conservation, including the Dogger Bank in the southern North Sea, which is protected under the EC Habitats and Birds Directive (with different approaches) by the countries which include this area within their EEZ (UK, Netherlands, Germany and Denmark). The whole North Sea has been declared a special area under Annex V of the MARPOL Convention (the International Convention for the Prevention of Pollution from Ships) which prohibits release and disposal of garbage and other domestic wastes from ships. The North Sea Commission is a politically-led cooperation platform for regions around the North Sea, bringing together the Presidents and delegates appointed by the Regional Authorities immediately below the level of Government which border the North Sea. Through dialogue and formal partnerships, they aim to promote common interests, especially in relation to European Union institutions, national governments and other organizations dealing with issues that are relevant to the North Sea. The focus for the North Sea Commission's work is the North Sea Region 2020 strategy document. It defines the following focus areas under the priority 'Managing Maritime Space'; maritime spatial planning, exploitation of marine resources and the North Sea Maritime Stakeholder Forum. NSMC is a not-for-profit collaboration between business, scientific and academic expertise for the benefit of the regional marine sector, developing new avenues for marine science and service, and fostering collaboration across the marine-related sectors in the North Sea. A web-based forum for sharing information relevant to maritime affairs across Member States. This MSEG meets on a regular basis and with the objective of developing the guidance supporting the implementation of the MSP Directive, on aspects such as co-operation across borders and the use of data. OSPAR monitors MSP developments as these relate to implementation of the Marine Strategy Framework Directive but no longer has an active MSP working group. MASPNOSE was a study carried out for the European Commission, focussing on the issue of cross-border maritime spatial planning. The project undertook two case studies in the North Sea, engaging governmental parties and stakeholders (fisheries, NGOs and other industry bodies). One focussed on developing an international fisheries management plan for the Dogger Bank in the central North Sea, and the second looked at potential areas of collaboration for wind energy and the harmonisation of marine planning on Thornton Bank in the southern part of the North Sea. The project concluded that cross-border co-operation efforts often lacked commitment and did not lead to a unified marine spatial plan for the area, and that a pre-agreed process with a clear mandate and responsibilities was necessary.